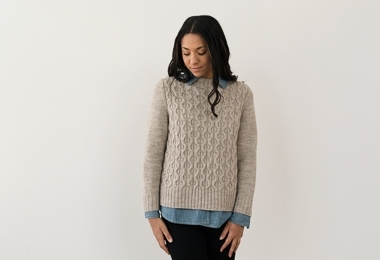 Designed for Purl Soho by Julie Hoover, her beautiful Hawley pullover is thoughtfully designed for ease, from its simple stitch pattern and intuitive construction to its flattering fit. Knit in pieces and then seamed, this is a wonderfully uncomplicated pattern that will challenge beginners and keep experienced knitters interested… The perfect balance! Knit up in our Good Wool, we love that it’s super affordable but also that its undyed natural beauty is reminiscent of a classic fisherman’s knit… without the traditional itch. Good Wool also has amazing loft and stitch definition, making each detail of the Hawley distinct and truly lovely! For more information, including materials, gauge, and sizes, please click Product Details, above.